Intel remotely fired up the audience today at the IDF R&D Forum Keynote by wirelessly powering a light bulb from a distance of 2 feet away. Using a signal generator and a power amplifier, wireless power transfer was effectively showcased by Alanson Sample from Intel Research, Seattle. 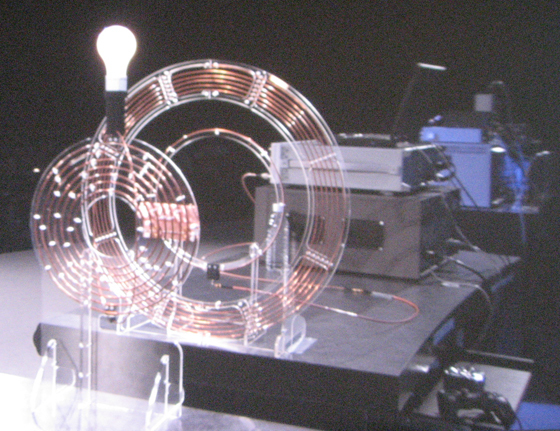 Transmitting 60 watts at 75% efficiency, the technology lit up a small light bulb perched upon a set of odd-looking coils. Originally developed at MIT, the demonstration worked by creating resonance between two magnetic fields. A comparison would be the famous example of an opera singer maintaining a high note long enough to shatter glass. This was the first public demonstration since the prototype was first developed last year. With a four-year time frame in mind, the technology could eventually be used to power everything from laptops to cell phones. If the technology can be scaled for ubiquity, it “might make more sense to charge a capacitor instead of a battery”. When leaving an area supplied by wireless power, future devices could run off of quickly charging capacitors.